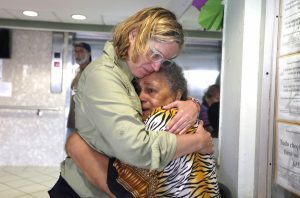 Fierce And Feminine: Mayor Carmen Yulín Cruz Models Leadership For Women The World Over. With the World’s eyes upon her, I want to keep it focused on the importance this woman’s courage shows by example. The article attached is worth the read. Author Margie Warrell has said it best with practical ways to be your own brave self. My point is to promote what we, as women, can do together to help and encourage each other. 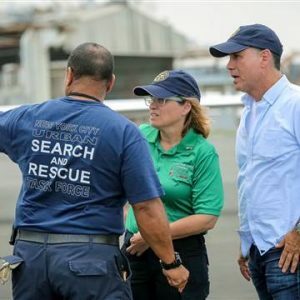 While other leaders played the “political” card from a safe distance, Mayor Cruz went into action on the front lines of the disaster that befell Puerto Rico, the US Virgin Islands and much of the Caribbean. 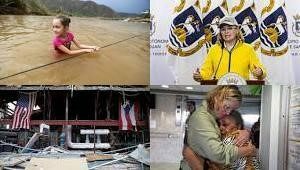 Watching news feeds, my heart broke by what they were enduring and still are. The death toll continues to rise, though buried in news stories. Still very little power restored. Still no safe, drinkable water. Still a very real crisis after more than a month. I watched in awe and admiration all the while being horrified with the lack of help being rendered to them. I posted before about the Jones Act, which was only lifted for a couple of weeks and which we can demand our congressional representatives dissolve. We can continue to send donations. We can spread the word and show up where called upon. And we can be courageous in whatever we are faced with. Thank you to those who posted of their donation support. Look for your hero’s. They are everywhere. They are the ones who will lift you up when you are down. They are the ones who put others well-being before their own. You might be your own hero waiting to be called upon. We are better together. I just want to mention I am just beginner to blogging and definitely enjoyed this web-site. Almost certainly I’m planning to bookmark your blog post . You really have amazing articles. Cheers for sharing your web-site. I simply want to mention I am new to blogging and certainly savored your web site. More than likely I’m planning to bookmark your blog post . You actually come with excellent articles. Many thanks for revealing your website. I do believe all the ideas you’ve presented for your post. They are very convincing and can definitely work. Nonetheless, the posts are too brief for beginners. May you please extend them a little from next time? Thanks for the post. Thanks for any other informative site. Where else may I am getting that kind of information written in such an ideal manner? I’ve a challenge that I am just now operating on, and I’ve been at the look out for such info. I’m still learning from you, while I’m trying to achieve my goals. I absolutely enjoy reading all that is written on your site.Keep the information coming. I loved it! After study a couple of of the weblog posts in your web site now, and I really like your method of blogging. I bookmarked it to my bookmark web site listing and will likely be checking again soon. Pls take a look at my website as properly and let me know what you think. Usually I don’t read post on blogs, but I would like to say that this write-up very forced me to check out and do so! Your writing taste has been surprised me. Thank you, very great article. Excellent site. Plenty of useful information here. I¡¦m sending it to a few buddies ans additionally sharing in delicious. And obviously, thank you to your sweat! It¡¦s really a cool and helpful piece of info. I¡¦m glad that you just shared this helpful info with us. Please stay us informed like this. Thank you for sharing. Thanks for every other wonderful post. Where else could anybody get that kind of information in such an ideal manner of writing? I’ve a presentation next week, and I’m on the look for such info. Thank you, I’ve just been searching for information about this subject for ages and yours is the best I’ve discovered till now. But, what in regards to the conclusion? Are you certain about the supply? Howdy there, just got receptive to your web page through Bing, and have found that it’s very beneficial. I will appreciate should you keep up these. Very interesting details you have remarked, regards for posting . “Curiosity is the key to creativity.” by Akio Morita. Heya here, just turned aware about your blog through Yahoo and bing, and discovered that it is pretty helpful. I’ll take pleasure in should you decide carry on such. You could definitely see your enthusiasm within the paintings you write. The arena hopes for even more passionate writers like you who are not afraid to mention how they believe. All the time go after your heart. “In America, through pressure of conformity, there is freedom of choice, but nothing to choose from.” by Peter Ustinov. Hey here, just got receptive to your weblog through Bing, and discovered that it is very informative. I will appreciate if you decide to continue these. I simply desired to thank you so much yet again. I’m not certain the things that I might have gone through without the entire smart ideas documented by you concerning such a problem. It became the scary difficulty for me personally, nevertheless viewing the specialized mode you processed that took me to weep with joy. I’m grateful for your service and as well , pray you recognize what an amazing job you happen to be getting into instructing people today using your webpage. I am sure you haven’t come across any of us. Some genuinely great content on this web site, appreciate it for contribution. “Give me the splendid silent sun with all his beams full-dazzling.” by Walt Whitman. I’ve learn several excellent stuff here. Definitely price bookmarking for revisiting. I surprise how much effort you set to create one of these excellent informative web site. I’ve learn a few excellent stuff here. Certainly price bookmarking for revisiting. I wonder how a lot attempt you set to make this sort of fantastic informative website. It’s actually a great and helpful piece of information. I’m satisfied that you simply shared this useful info with us. Please keep us informed like this. Thanks for sharing. Hello, Neat post. There is an issue with your site in internet explorer, would test this… IE nonetheless is the marketplace leader and a large part of other people will miss your fantastic writing because of this problem. You just did….communicate with me. Because I receive many dozen comments a day, and because I post once a week, I rarely have time to reply. Thanks for finding my blog. Please share and comment anytime. In two years and over 100 posts this blog has found it’s heart and growing audience. It’s truly a labor of love. It is in reality a great and helpful piece of information. I am satisfied that you just shared this helpful info with us. Please keep us up to date like this. Thank you for sharing. I will right away take hold of your rss feed as I can not to find your email subscription link or e-newsletter service. Do you have any? Kindly allow me recognize in order that I could subscribe. Thanks. I post a blog once a week, on year three now.